​Thanksgiving has passed, and it’s about time to pack up the family for your annual tree hunt--a trip full of tradition, fun, and festivity! Be it a fir, pine, or spruce…they’ve all got potential to last through to the New Year if given proper care. Here are a few tips from our in-house experts on how to keep those needles off the floor, until well after old Saint Nick makes his appearance. It all starts before you even step foot on the Christmas tree farm. Before bundling up to leave, measure your space! Measuring the height and width of the area where you plan to deck out your tree can prevent potential hassles when setting up, and –don’t forget to count space for your tree stand and tree topper. Measure the width of your tree stand, to ensure your tree’s trunk isn’t too wide. You never want to trim bark from the trunk to fit in the stand, as that’s where the tree’s vascular tissue is found which allows it to draw up water. And, a tree that doesn’t draw up water is guaranteed to lose needles! Next, you’ll need to find a retailer! We suggest you shop local, or better yet…PA Preferred. If you prefer to shop from a lot and not cut your own, find one that sources their trees from a local farm to ensure it’s fresh and healthy. When not from a local farm, trees on a lot are already three to four weeks old when you take them home. Cutting your own tree guarantees it’s fresh. And, the fresher the tree, the longer it’s likely to hold its needles! Check the color – look for a tree with a consistent green color throughout. Yellow or brown needles are indicators of health issues, and also shed faster than healthy, green needles. No tree is perfect, but if it’s over 5% discolored, move on to another tree. Feel the branches! Test an outer branch by bending it. A fresh tree should give without breaking. Also check the needles for freshness by grasping a branch and moving your hand out to the end. Fresh needles will bounce back and not snap off. Give it a shake – an unhealthy tree will drop a large pile of needles, while a healthy one will only lose a few. The last thing to check before choosing or cutting your tree is praying mantis egg cases. While out in the field these insects will kill other insects that damage Christmas tree foliage. In the home they can be a nuisance. Bringing the egg case into your warm home can induce the mantis eggs to hatch. Simply remove the casing from your tree and leave it on the farm. 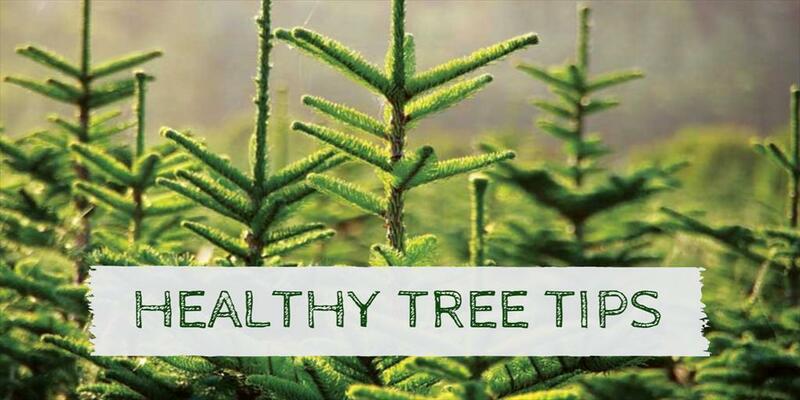 If you’re on a lot, ask the retailer to give your chosen tree a fresh cut. This will remove the hardened sap and allow it to draw in more water. Once your fresh tree is home, remember to keep the stand consistently full of water. Check the water level often during the first few days, as that’s when it will take in the most. Following that, check the water daily to make sure it stays well above the cut end of your tree. Follow these tips and you’ll enjoy a healthy tree, from Thanksgiving weekend to New Year’s Day!